Laissez les bon temps rouler! It’s (almost) Mardi Gras in time! We may be far from the big festivities in Louisiana and Mississippi, but we can still “let the good times roll” right here in Northern Virginia with our own celebrations! Mardi Gras, for “Fat Tuesday,” refers of course to the carnival season that starts on or after the Christian feasts of the Epiphany and ends on the day before Ash Wednesday. In some parts of the country, especially along New Orleans and other parts of the south, the Mardi Gras season is a major event with numerous parades, festivals, and galas. 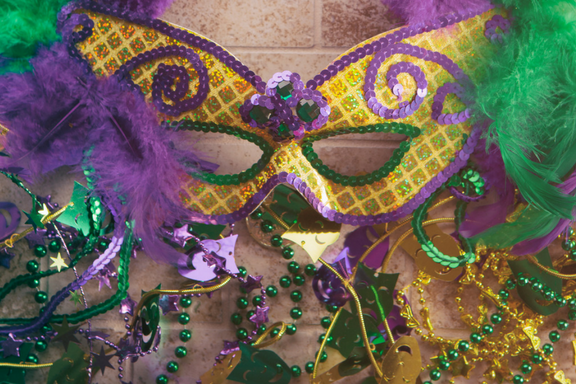 And yes, you have ways to celebrate Mardi Gras in Northern Virginia! Our events may not be as big but it’s great we still have these fun celebrations. And if the words “Mardi Gras” strike a bit of panic in you as thoughts of debauchery and non-kid-friendly behavior come to mind, have no fear: the events below are family-friendly. The newest Mardi Gras celebration in the area is hosted by The Wharf, the Let the good times roll at this recently expanded waterfront complex in Washington, DC. At this event, which made its debut in 2018, catch some beads, dance in the streets, feast on festive food, and toast to Fat Tuesday! The New Orleans-inspired parade takes place along Wharf Street, with a dance party at District Pier, and a fireworks finale that will light up the night in purple, green, and gold. The fun takes place from 6 pm to 8 pm. The “baby” of local Mardi Gras celebrations is the Falls Church Mardi Gras Parade, which has its second year in 2018. The annual Little City Mardi Gras Parade, featured floats, beads, and live music from Little Falls to the Beach Shack down Park Avenue, followed by more live music at Clare and Don’s afterwards. No announcement has been made yet for 2019. Another fun celebration, albeit a bit further out (about an hour away) is the Mardi Gras celebration in downtown Culpeper, Virginia. Culpepper Carnival is an all-day festival with fun for the entire family including live music, performing artists, wagon rides, New Orleans-inspired food, face-painting, crafts, balloon-magic, mask making, and in-store specials. Share the post "Mardi Gras in Northern Virginia"